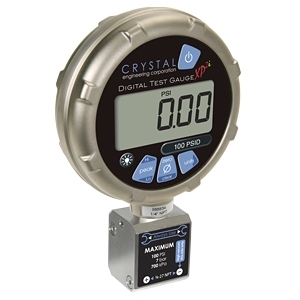 The XP2i-DP is a very rugged, intrinsically safe, Differential Pressure Gauge that has 0.1% of reading accuracy and is capable of use over continuous vacuum. Static line pressure effect is 0.0003 psi per lowest applied test pressure. Density of water conversion can be selected via the keypad: 4Â°C, 60Â°F or 20Â°C /68Â°F. Display rate: 3 readings per second. Numeral display height: 16.5mm (0.65") single line display. Battery: Three size AA (LR6) batteries. Battery life: 1500 hours typical (alkaline battery). This unit is instrinsically safe only if powered by Rayovac Maximum Plus, Energizer E91, Energizer EN91, or Duracell MN 1500 batteries. Replace batteries only in non-hazardous locations. Weight: 915g (2.0 lbs), including batteries. Permanent fill dual diaphragm seal (filled with Dow Corning 200). Do not use the RS-232 connector in a hazardous area. Liquids and gases compatible with 300 Series stainless steel and buna-n (o-ring).